I liked the second photo of Pierre so much more than the original I decided to get his autograph on it as well. He liked it, but told me that I didn’t have to keep doing this… (referring to making cards of him). Pierre Turner collected 76 tackles and 8 sacks playing linebacker during his 4 years with the Richmond Spiders. 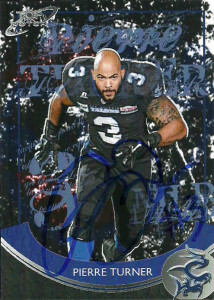 He joined the Arena Football League in 2011 splitting time with the Cleveland Gladiators and Orlando Predators tallying 22 tackles, 3 sacks, and a forced fumble. In 2012, he’d join the San Antonio Talons where he racked up 30.5 tackles, 5 sacks, and a forced fumble. He’d have another 26 tackles and 4.5 sacks in 2013. An injury riddled 2014 resulted in 19 tackles and 2 sacks. With the Talons going on ‘hiatus’ after the 2014 season, Pierre was signed by the Jacksonville Sharks and had 14 tackles and a sack. 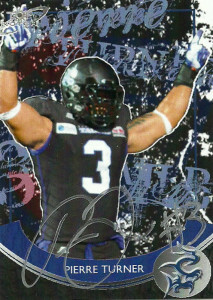 In addition to playing linebacker, Turner briefly moonlighted as a fullback for the Talons carrying the rock 6 times for 11 yards and 2 touchdowns. Acquired: In Person, 5/3/2014 Talons vs. Barnstormers. Carlton Brown earned First Team All SW Athletic Conference honors in 2005 after recording 27 tackles and 4 interceptions in 11 games for Jackson State. 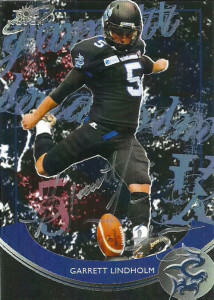 He’d sign with the Utah Blaze in 2008, and record his first interception in 2010 while with the Milwaukee Mustangs. 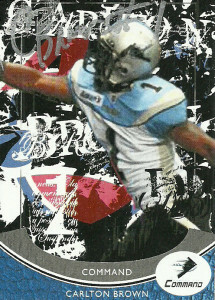 Brown played the 2011 campaign with the Kansas City Command, and return to the Blaze in 2012 for a 5 interception performance. 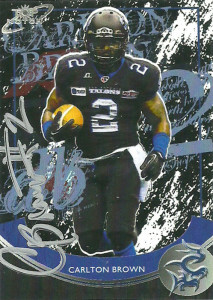 Mercenary defensive back Carlton Brown found a home with the San Antonio Talons in 2013, compiling his best season as a pro with 63 tackles, 10 pass blocks, 1 forced fumble and 8 interceptions. He’d be hit by the injury bug in 2014 after recording an additional 2 picks and 10 tackles. With the Talons suspending operations after the season, he’d play for both the Jacksonville Sharks and the LA Kiss in 2015. Over his time in the league, Brown has also served time returning kicks boasting a 15.8 yard average on 101 returns and 3 touchdowns.